But these days even famously “nice” Kohn finds herself wanting to breathe fire at her enemies. It was time, she decided, to look into the epidemic of hate all around us and learn how we can stop it. 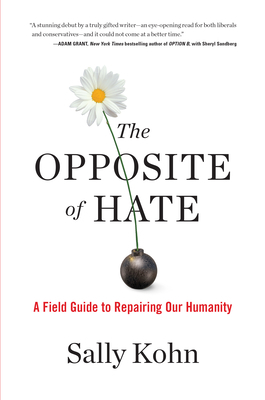 In The Opposite of Hate, Kohn talks to leading scientists and researchers and investigates the evolutionary and cultural roots of hate and how incivility can be a gateway to much worse. She travels to Rwanda, the Middle East, and across the United States, introducing us to former terrorists and white supremacists, and even some of her own Twitter trolls, drawing surprising lessons from dramatic and inspiring stories of those who left hate behind. Sally Kohn’s engaging, fascinating, and often funny book will open your eyes and your heart.